I recommend companies using social media for marketing have a blog on their websites. Besides all of the other pages on a website, a blog is an easy place to add news, articles, and other pieces of content. Blogs have been shown to improve search engine traffic, and bring return visitors back to your website. With the ease of setting up a WordPress.com blog, or even install WordPress on your company domain, millions of blogs are being started everyday. But in my 10 years of experience, simply starting a blog isn’t enough. It’s similar to setting out on a trip from NYC to San Diego without a map. You know the general direction, but it’s far too easy to get lost. 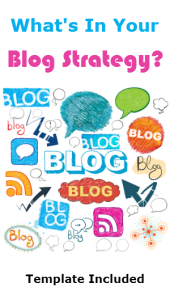 I recommend companies use a blog strategy to plan out who they will target in their posts, the content they will write, and how they will turn visitors into subscribers and buyers. I’ve written out a sample blog strategy, that you can download at the bottom of this post. It’s a template that the following information will explain. Feel free to print out this post as instructions for the template. Part 1- Personas- Who Are Your Ideal Customers & Clients? Hubspot is one of the industry leaders really trying to help companies understand who their customer is. The persona isn’t simply a short sentence of who your client is, as I’ve written in the blog strategy, but a much more in-depth description outlining your client’s wants, needs, pain points, professional status, and more. Although I used short sentences, it’s best to really understand who your client is, with as much detail as possible. When you do this, you can better understand who you are writing each blog post for. You can be specific with targeting these people, by understanding their lives, empathizing with their struggles, and can helping them make the best purchase for their needs. For the use of our blog strategy template, a sentence for each of 5 buyer personas will suffice. Part 2- Keywords- What Are Your Visitors Searching For? It’s easy to go out and choose the keywords you want search engines to send you traffic for, but you need to put some real thought into the keywords you choose. For instance, in the template, the sample I am using is dog training, but, there are many thousands of keywords that fall under that same topic. With each keyword you want to envision your visitor searching for the keyword, think about what they are really looking for. When they search for potty training my puppy, they are looking for suggestions to help them solve a problem. If they search for potty training Cesar Millan, they are checking to see if Cesar has a product on potty training, and are more likely to make a purchase if they find this product. It’s best to target longer keywords, such as 4-6 words long. Now, with all of the search engine optimization changes over the past year and a half, it isn’t a good idea to put too much stock into optimizing for one keyword. But keyword research is still necessary, because of the generalizations you can make about what the visitor is looking for and the information you can provide them. Certainly you’ll write a different blog post about puppy potty training than you will potty training your rescue dog, right? Part 3- Blog Schedule – Who and How Often Will You Post? How often will you blog and who in your company will do it? The more often you blog, the more traffic you will see coming to your blog posts. But if you simply do not have the time and money resources to write daily, or several times a week, write as often as you can. Use a schedule because it gives visitors an idea of how often to visit, and it tells search engines when to visit again. I recommend starting to use an editorial calendar here as it will help you select who is going to write, what the topic is, and the date it should be published. Visit my post on using Trello and WordPress to plan your blog posts, as I mention plugins for editorial calendars there. What types of blog posts will you write? Here are several that I consider and the percentage of these posts I would use. For the Visitor– Post they directly benefit from, and come to the site to read. 50% of your posts. For Everyone– Posts that interest many more people in the industry, bring in more generic traffic, but give your company due exposure. 30% of your posts. For the Company– Posts you want your visitors to read, about you, successes in your business, changes in your business, things you find yourself wanting to share, such aas thought leadership posts. 20% of your posts. I suggest writing out 50 blog posts ideas that fit these categories, the personas and keywords you’ve chosen so far for your company. It doesn’t matter which you pick first. You’ll see in the template how I set up the first blog post to show you what I mean. Calls to Action– After each blog post you can display an image with a call to action, telling the visitor what to do next to either get more information, accept a free offer, or get a quote. I make calls to action with http://buttonoptimizer.com/ but they can be much more detailed if you use Photoshop or have a designer make them. Downloads– These are the videos, PDFs, or audio files you want your visitor to download. It should provide them with something valuable that is related to your services and products. For instance, the blog template file is a download. 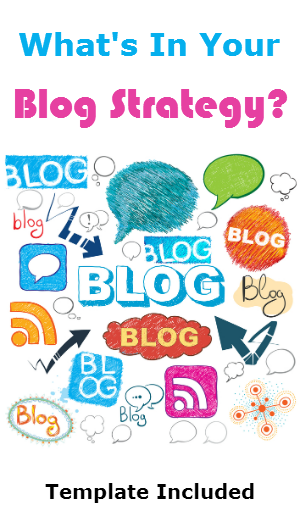 Here is the link to download the blog strategy template, it is a .doc file, to make it easy to edit. This blog strategy might sound like a lot of work, but it is worth it, to see the results you hope to get from blogging. I use this same template for clients, but customize it to their keywords, products and industries. If you have any questions or, suggestions on how to make this work even better, please contact me and let me know, I’d love to include your comments. Well written. For me, I don’t really have a blog strategy to be honest. Shared on Triberr for you too. Hey, even if your strategy is simple to follow, it is still one that works for you. I think it looks great. I’ve found for me that keeping a persona in mind when I write is very helpful, but it isn’t for everyone. Thank you for commenting and visiting, I love coming to your blog to read as well, great stuff. That’s great, what do you use for your editorial schedule? Nice post Mary. It’s so important to have a strategy. We try to post daily. Thanks again! Strategy is key point of success.. strong strategy makes maximum probability of success… thank you very much to share such a very fantastic post….